New applications for unemployment insurance benefits plunged by 41,000 to 220,000 in the second week of 2018, the Labor Department reported Thursday, the lowest level in nearly 45 years. The report easily beat forecasters expectations for new jobless claims to drift down to around 250,000. ow jobless claims are a good sign because they suggest that layoffs are relatively scarce. Federal Reserve officials and investors watch the numbers because they come out weekly, providing an early warning sign of any trouble...New claims have scraped multi-decade lows several times in recent years as the jobs recovery steadily reduced the number of unemployed workers throughout the end of President Obama's term and the beginning of President Trump's. The total number of people receiving unemployment benefits, which are available for up to 26 weeks in most states, stayed below 2 million, also near the lowest levels since the 1970s. And at 4.1 percent in December, unemployment is as low as it has been since the dot-com bubble. An NPR/PBS NewsHour/Marist poll found that when voters were asked which party’s candidate they’d more likely vote for in their district, 46 percent of registered voters said Democrats, while 40 percent went with Republicans. Nine percent are undecided. That shows a sizable decline from December polling, which found Democrats leading by 13 points on generic ballot polling. Thursday’s poll found more welcome news for Republicans among registered voters who identify as Independents. Among [Independent] voters, Republicans led by 2 points, with 38 percent of those voters saying they’d vote for the GOP candidate, while 36 percent said the Democratic candidate. In December, polling found that Democrats were leading among Independent voters by 11 points. 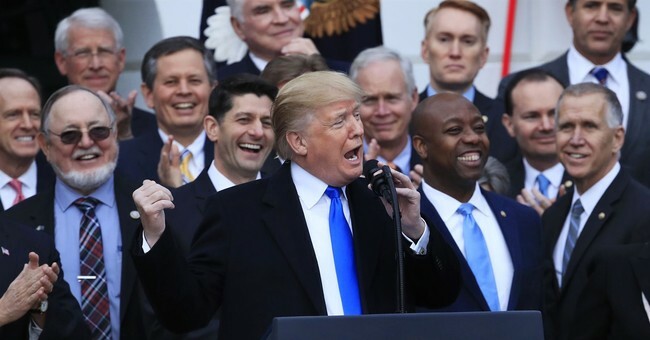 A few words of caution: (1) There's a long way to go between now and November, so even a tax reform-caused uptick for the GOP in early 2018 could be wiped away as a distant memory by the spring, let alone the fall. (2) The Marist number is an outlier. Or is it?